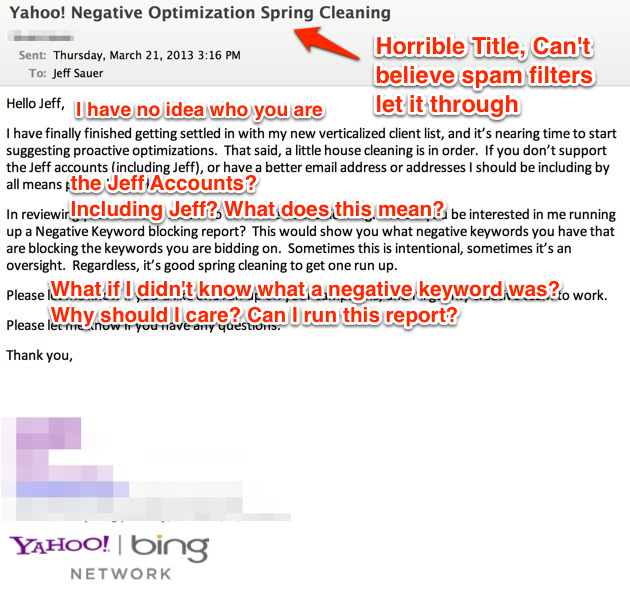 Not long after I posted about PPC Optimization emails and why they should be ignored, I received another optimization email from Yahoo, and this one is too good not to post as a follow up. If you did not have a chance to read the previous post, the premise was that Search Engines are hurting their brand and annoying their power users by sending unsolicited “optimization” emails to their PPC clients. Essentially, these emails just serve to alienate customers and offer very little valuable advice. At the end of the post, I offered a template that the search engines can use for outreach that could be used to create a truly valuable relationship between advertiser and advertising network. Apparently, nobody was listening, because I received an email from Yahoo last week that was probably my favorite PPC Optimization email of all time. Please note, I have not modified this message at all from its original format. All that was changed was obfuscation of the representative’s name and contact info. Why is this email worthy of a blog post? Let me count the ways! First of all, the headline to the email is really confusing. What is a negative optimization? How does it have to do with spring cleaning? I have stared at this email in my inbox for several days in disbelief, trying to understand why someone would think that this is a good introduction. I don’t know who this person is, why it’s taken them so long to get settled in, and a verticalized client list means. I also am not sure why house cleaning is in order to make proactive suggestions. Even better, I am not sure what a “Jeff” account is and why it is including Jeff. Obviously this isn’t a client of mine. Perhaps it’s something that I had running years ago but forgot about? I don’t think I have ever personally advertised with Yahoo, outside of $100 here or there when I first started my consulting business in 2005. Is that the account in question? If so, was this person settling in for the past 8 years? Are Negative Keywords Really That Debilitating? I am pretty sure that if I created an account with Yahoo, it was done before negative keywords were implemented on their system. I also doubt that I had so many negative keywords in place that it would cause a problem with ad serving. Even if I did have a lot of negative keywords in place, that is not the first place I would concentrate my efforts if I were Yahoo!. In reality, a negative keyword is almost exclusively used by a PPC manager who knows what they are doing. It helps sculpt an account into a perfect structure that eliminates inefficiency and represents cost savings for an advertiser. By suggesting that we clean house on our negative keywords, this rep is really just suggesting that we spend more money with Yahoo! and stop trying to be efficient. Is that really what Yahoo! needs to be suggesting to their clients at this point? I would argue that it’s not where focus is needed. At the end, this rep suggests that if I want “one run up” on my campaigns, they will get their creative team to work. Why we would need a creative team for text based search ads is beyond me. Am I Being Too Hard on The Search Engines? Midway through writing this post, I wondered if I was being too hard on the search engine for writing these emails. Now I think that maybe I am not being hard enough on them. I am the customer. Search engines are extremely profitable (well, other than Bing) due to the growing nature of search advertising. I have personally helped Google, Yahoo and Bing make over $25 million to date. This email looks like it cost about 2.5 cents to create. Frankly, it’s insulting. Maybe some of these massive profits should be reinvested in a business writing class for your representatives?